The 2018 Toyota 4Runner focuses on utility for families and outdoor adventurers, with off-roading a main attraction of this midsize SUV. Take a day trip with plenty of cargo space to fit any outdoor gear, and still experience the 4Runner’s comfortable interior and reliable safety features. The Toyota 4Runner’s durability is well-known, and Andy Mohr Toyota is here to tell you all about this standout midsize SUV. If you’re an active person with a penchant for seeking adventure outdoors, the Toyota 4Runner may be a match for your needs. It has six trims, with plenty of options for off-road capabilities, and a comfortable interior that seats five. A third row is also available, for a maximum seating capacity of seven. Four-wheel drive is available on every trim, and when you’re on tough terrain, the 4Runner’s off-roading capabilities kick in. Each 4Runner comes with a 4.0L V6 engine that provides 270 horsepower and 278 lb-ft of torque. Whether you’re heading up a mountain pass or merging onto the highway, the 4Runner will have no issues, and the powerful V6 engine can tow up to 5,000 pounds. Whether you’re off-roading or just driving around Avon, Indianapolis, and Plainfield, the 4Runner’s interior has room for everything you’re carrying along with you for the day. Fold-flat second-row seats give you up to 88.8 cubic feet of cargo space, including 47.2 cubic feet behind the second-row seats. When not folded down, the seatbacks recline, so everyone is comfortable. If you’re spending some time in your car, it’s best that you’re relaxed and comfortable while doing it. All 4Runners come with a power-adjustable driver’s seat with lumbar support, while the 4Runner Limited trim features heated and ventilated front seats. 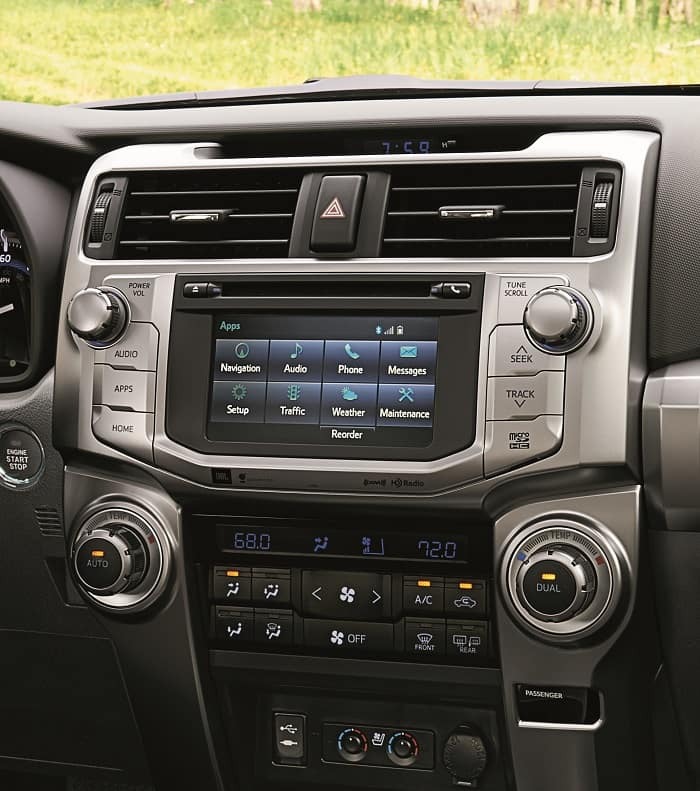 In terms of multimedia, the 2018 4Runner comes standard with a 6.1-inch high-resolution touchscreen display with eight speakers, voice recognition, Bluetooth®, and Siri® Eyes Free. With large knobs and buttons, the system is easy to learn, which allows you to focus on where you’re going. The 4Runner protects you and your passengers, with a driver and front-passenger advanced airbag system, front seat-mounted side airbags, and all-row roll-sending side curtain airbags. Plus, it received a 4-Star Overall Safety Rating from the National Highway Traffic Safety Administration, which is not only helpful for off-roading adventurers, but is also important for those staying on pavement. Toyota’s Star Safety System™ also comes standard on the 4Runner, with six safety features designed to help protect you. This includes Electronic Brake Force Distribution, which adjusts the brake power delivered to the front and rear wheels based on the number of passengers and amount of cargo on board. The 2018 Toyota 4Runner, known for its capabilities when it comes to off-roading, is a responsible choice for many Avon, Indianapolis, and Plainfield drivers, thanks to proficient cargo space, a comfy interior, and respectable safety ratings. Andy Mohr Toyota would love for you to see the 2018 Toyota 4Runner’s features in person, so schedule a test drive with us today. We look forward to helping drivers like you find an SUV that fits your everyday needs.